Luther Bertran Culpepper, Jr., White, Male, married Margaret Adelia Twiford in 1936 in Pasquotank Co., NC. The Daily Reflector, Greenville, Pitt Co., North Carolina. Obituary of Wilbur Augustus Culpepper (#1331), published 23 Dec 2007. Luther B Culpepper, II is the father of Luther Bertran Culpepper, III, Male, born 1944 in Pasquotank Co., NC. Luther B Culpepper, Jr. and Margaret Adelia Twiford are the parents of Jayne Lillian Culpepper, Female, born 25 Mar 1948 in Pasquotank Co., NC. Obituary of Margaret Twiford Culpepper, published 27 Sep 1997. Luther Bertran Culpepper, III is the father of Luther Bertran Culpepper, IV, born __ 1968, and Alfred Stanley Culpepper, born __ 1971, both in Hertford Co., NC. Luther Bertran Culpepper, III, White, Male, 22, married Sarah Ann Joyner, 23, on 23 Apr 1967 in Northampton Co., NC. Norman A. Wiggins School of Law, J.D. Source: http://www.martindale.com (retrieved 21 Jan 2010). Responsibilities: Statewide extension weed science programs for cotton, small grains, and vegetable crops. Source: http://mulch.cropsoil.uga.edu/weedsci/faculty/culpepper.html (22 Feb 2010). Obituary* 23 Dec 2007� ELIZABETH CITY - Wilbur A. Culpepper, 86, of 1503 Crescent Drive died at his residence Saturday, Dec. 22, 2007. He was born in Elizabeth City to the late Luther B. Culpepper Sr. and Glennor Murphy Culpepper and was the husband of Bessie Newby Culpepper. Mr. Culpepper was a retired rural mail carrier, a member of the First United Methodist Church, a former member of the B.P.O. Elks No. 856 and E.C. Lion's Club. He served for many years as a BSA Scout Leader for Troop No. 153, also served as a member of the E.C. Housing Commission, and Pasquotank County Board of Elections. Mr. Culpepper served our country during World War II in the U.S. Navy. Besides his wife, he is survived by two sons, Andrew "Andy" Culpepper and wife, Sharon, of Greenville, and Lee Culpepper of Elizabeth City; one sister, Glennor C. Carter of Tampa, Fla., and a brother, Luther B. Culpepper Jr. of Elizabeth City. Also, surviving are three grandchildren, Hope C. Mewborne and husband, Jeff, Lisa C. Taylor and husband, Rob, and Sara C. Conway and husband Charles; seven great-grandchildren, Travis Mewborne, Luke Mewborne, Andrea Mewborne, Matthew Taylor, Carly Conway, Andrew Conway, and Graham Conway. He was preceded in death by a brother, Edwin Murphy Culpepper. Wilbur Augustus Culpepper, White, Male, married Millicent Elizabeth Newby in 1942 in Pasquotank Co., NC. Wilbur Augustus Culpepper is the father of Anthony Andrew Culpepper, Male, born 1943, and Michael Lee Culpepper, Male, born 1946, both in Pasquotank Co., NC. Obituary* 17 Apr 2016� Millicent Elizabeth "Bessie" Culpepper, 94 of Crescent Drive, Elizabeth City, NC died Friday, April 15, 2016 at her residence. She was born on November 24, 1921 in Elizabeth City, NC to the late Frank Mullen Newby and Lillie Brothers Newby and was the widow of the late Wilbur Augustus Culpepper. 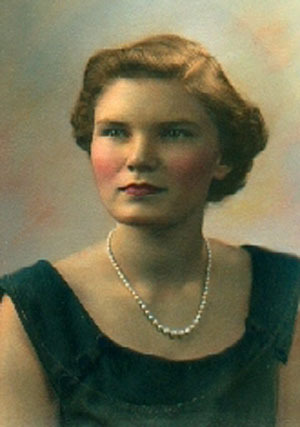 Mrs. Culpepper is survived by two sons, Andy Culpepper and wife, Sharon, of Greenville, NC and Lee Culpepper of Elizabeth City, NC, three grandchildren, Hope C. Mewborne and husband, Jeff, Lisa C. Taylor, and Sara Culpepper; eight great grandchildren, Travis Mewborne, Luke Mewborne, Andrea Mewborne, Matthew Taylor, Carly Conway, Andrew Conway, Graham Conway, and Millicent Elizabeth Culpepper. Besides her husband and parents, she was preceded in death by a sister, Margaret N. Swain. Mrs. Culpepper graduated from Elizabeth City High School in 1938 where she was a majorette for the band. After high school she attended Louisburg College and majored in business. In 1942, she married Wilbur and began working at the Elizabeth City Naval Blimp Base and continued working there for the duration of World War II. After her children were born and in school, she began her 36 year career at The Daily Advance, first as Society Editor and later as City Editor and Lifestyles Editor. As a journalist she won a national award for photography and awards in every category possible except sports from the North Carolina Press Women's Association. Mrs. Culpepper served on the North Carolina Board of Economic Development under Governor Jim Hunt. She was the first woman to run for a seat on the Pasquotank Board of County Commissioners. She lost, but was later appointed by the county commissioners to the position of Pasquotank County Coroner because she was the only person attending the Commissioners' meeting when the coroner's position needed to be filled. She jokingly credited her service as coroner as the impetus for the establishment of the state-wide Medical Examiner's Office. She was a proud member of the Fellowship Class of the First United Methodist Church, the Daughters of the American Revolution, the Albemarle Hospital Auxiliary and the Friends of the Museum of the Albemarle. Mrs. Culpepper was a former member of the board of the Albemarle Home Health. Obituary of Bessie Culpepper, Published in The News & Observer on Apr. 17, 2016. Anthony Andrew Culpepper and Beverly Sharon Pierce are the parents of Andrea Hope Culpepper, Female, born 1969 in Wilson Co., NC. Anthony Andrew Culpepper and Beverly Sharon Pierce are the parents of Sharon Elizabeth Culpepper, born __ 1971, and Sara Perry Culpepper, born __ 1974, both in Lenoir Co., NC. Source: http://www.martindale.com (Retrieved Jan 2000). E-mail written 1998 to Lew Griffin from Hope Culpepper Mewborne. E-mail written Oct 2005 to Warren Culpepper from Sharon Elizabeth "Lisa" Culpepper Taylor, Warren Culpepper, e-mail address. He served as Special Assistant to the President of the University of North Carolina, and later as the Director of Legal Affairs, Univ. of NC Center for Public TV. Glennor Virginia Culpepper, White, Female, married Josiah Tidball Carter, Jr. in 1950 in Pasquotank Co., NC. Ella Culpepper (of Pasquotank Co.) and Miles E. Davis married 15/17 Jan 1904 in Camden Co., NC. Ella Lee Culpepper and Miles Edward Davis are the parents of Elbert Vernon Davis, Male, born 22 Feb 1906 in Pasquotank Co., NC. Ella Culpepper, White, Female, married Miles E Davis in 1904 in Pasquotank Co., NC. Margareth Pappendick, Mother-in-law, F, Wh, 65, wid, md@22, NC/NC/NC. Minnie Pappendick Culpepper, Female, White, Widowed, born 15 May 1894 in NC, died 29 Jan 1990 in Pasquotank Co., NC, SSN: 239-07-9267, resided in Dare Co., NC. George Clarence Culpepper, White, Male, married Minnie Pappendick in 1914 in Pasquotank Co., NC. George Clarence Culpepper is the father of George Clarence Culpepper, Jr., Male, born in 1916, Margaret Culpepper, Female, born in 1922, and Carolyn Culpepper, Female, born in 1928, all in Pasquotank Co., NC. Clarence Culpepper, Son, M, Wh, 3 6/12, sng, NC/NC/NC. George Culpepper, Male, White, Married, born 1891-1892, died 15 Feb 1969 in Pasquotank Co., NC. E-mail written 2002 - 2006 to Warren Culpepper from #1344) Laura Gaskill Carter (d/o Carolyn Culpepper, Reidsville, NC, e-mail address (Jun 2011). George Clarence Culpepper, Jr., White, Male, married Helen May Parker in 1941 in Pasquotank Co., NC. George Clarence Culpepper, Jr. is the father of James Clarence Culpepper, Male, born in 1944 and David Lawrence Culpepper, Male, born in 1955, both in Pasquotank Co., NC. E-mail written 2003 to Lew Griffin from Violet Woods, e-mail address. Carolyn Culpepper, White, Female, married James Marion Boykin in 1950 in Pasquotank Co., NC. Carolyn Culpepper Gaskill; 30 Oct 1928 - 24 Jun 1993; Female; White; 64 Years; Place of Death: Elizabeth City, Pasquotank Co., NC; Residence: Elizabeth City. Pasquotank Co., NC; Widowed; Burial in state; Birth: NC; SSN: 239485237; Fathers Surname: Culpepper. Mary Emma Culpepper, White, Female, married Jesse James Perry in 1914 in Pasquotank Co., NC. Lula Culpepper, White, Female, married Robert L Davis in 1915 in Pasquotank Co., NC. Gorgas Hospital, compiler, Panama Canal Zone, Gorgas Hospital Mortuary Records, 1906-1991, Online database at Ancestry.com, 2005. E-mail written Jul 2007 to Warren Culpepper from III (#57465) Horace Mayfield Culpepper, Sterling, VA, Phone 703-444-8614, e-mail address.